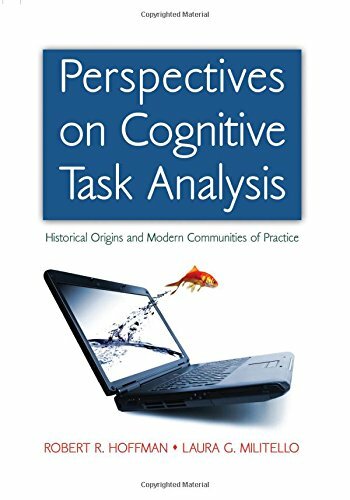 [PDF] Perspectives on Cognitive Task Analysis: Historical Origins and Modern Communities of Practice | Free eBooks Download - EBOOKEE! Posted on 2017-11-08, by luongquocchinh. Description: This volume is the first comprehensive history of task analysis, charting its origins from the earliest applied psychology through to modern forms of task analysis that focus on the study of cognitive work. Through this detailed historical analysis, it is made apparent how task analysis has always been cognitive. Chapters cover the histories, key ideas, and contributions to methodology of a number of communities of practice, including: Sociotechnics, European Work Analysis, Naturalistic Decision Making, Cognitive Systems Engineering, Ethnography, Human Factors. Further, integrative chapters focus on the purposes of cognitive task analysis. It is shown how all the various communities of practice are living in the same scientific universe, though are in many ways distinctive in terms of their key concerns and main theories. It is a historiography of task analysis, and the people who invented task analysis. It is also an explanatory primer on what cognitive task analysis is all about and what it can do. Perspectives on Cognitive Task Analyis will be of value to professionals in allied disciplines who might come to rely on cognitive task analysis in their system development programs. It will be invaluable to students who need to know what task analysis and cognitive task analysis are really all about. For practitioners of cognitive task analysis, this volume is a major presentation of what their scientific universe is all about. No comments for "[PDF] Perspectives on Cognitive Task Analysis: Historical Origins and Modern Communities of Practice".